Doylestown Farmers Market - Times Publishing Newspapers, Inc.
Join the Doylestown Farmers Market (DFM), at S. Hamilton Street between W. State Street and W. Oakland Avenue in Doylestown Borough, for their 44th season every Saturday, April 20th through November 23rd, for a taste of local food in Bucks County. From apples to pasta to goat cheese, the DFM showcases the best of our area’s vibrant food economy. From 8:00am to 1:00pm, the whole family will enjoy seeing, tasting, playing and learning from over 30 different vendors throughout the season. USDA Certified Organic, chemical-free and low-input vegetables, fruits and mushrooms, pastured Certified Organic meats, eggs, goat cheeses, fresh and dried herbs, cut flowers. Artisan breads, fresh pasta, baked goods, jams, sauces, olive oil, honey, condiments, pickles, hand-crafted soaps, aromatherapy items, alpaca yarn, knife sharpening, and more! Taste Fair Trade and Certified Organic coffee, microbrew beer and kombucha with farm-grown ingredients. Vendors cater to four-legged customers with preservative-free dog food! Early in the season look for heirloom vegetable, flower and herb starts and bedding plants for your garden along with expert advice how to grow them like a pro. Sample different varieties of seasonal fruits and vegetables side by side like peaches, apples and tomatoes. Enjoy performances each week from local musicians, chef demos highlighting seasonal market ingredients. Photo scavenger hunts encourage kids to become familiar with new vegetables and their farmers as the seasons change. Educational events, community groups and nonprofits provide interest and excitement for the whole family. Sign up to receive the Farmer’s Market weekly newsletter, including a list of vendors, details on events and musicians, recipes, ideas, and educational information about market products throughout the season. Visit the market tent to sign up or visit www.bucksfoodshed.org. As space is available, new food vendors are welcome. 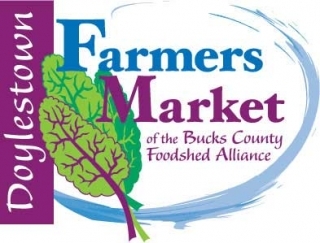 Go to www.bucksfoodshed.org and click on their logo in the upper right corner to find the 2019 Vendor Application and Contract. Doylestown Farmers Market is a subsidiary of the Bucks County Foodshed Alliance (BCFA). BCFA works to support a healthy and sustainable local food system and offers workshops on a range of topics such as gardening and food preservation. BCFA develops vital relationships with partners such as Penn State Extension and others in farming, retail, education, healthcare, restaurants and government. BCFA is a 501(d)3 public charity. Fundraisers include the Annual Appeal and annual Bucks Foodshed 5K Run in September at Delaware Valley University.